frontrowelectronics has no other items for sale. AUTHORIZED BOSE DEALER! FACTORY SEALED! - WARRANTY! *$55 for 12 months. Minimum purchase required. Bose Virtually Invisible 791 Main Stereo Speakers may be small, but they pack a whole lot of sound. They are in-ceiling speakers that are fully capable of evenly distributing the music you love throughout your listening area. The Bose Corporation rates them for 4-to-8-ohm impedance amplifiers. 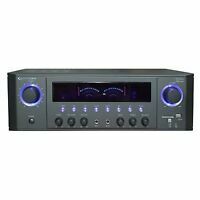 This means that they work optimally with amplifiers that are powered in the 10-watt range. You can connect them to your home theater system, too. 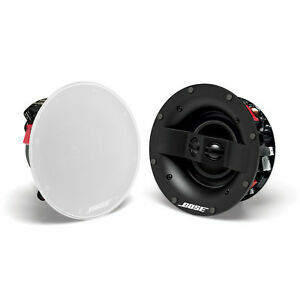 This pair of audio outputs can also be used as the center channel for any surround sound setup.Each in-ceiling speaker measures 13.5 inches by 12.4 inches by 11.8 inches and weighs 13.3 pounds. Inside each cabinet, you will find a 7-inch woofer and two 1-inch tweeters. These internal components are engineered to provide a complex audio experience with robust bass notes and pure-sounding high frequencies. There is no need for a separate loudspeaker enclosure because this product’s infinite-baffle design utilizes the space above the ceiling. With these audio outputs, you can listen to the music you love in one room of the house without disturbing others.Ceiling sound systems like the Bose 791 work the same way that recessed lighting systems work. They are mounted to be flush with the ceiling, and you have your choice of round or rectangular grates. They are capable of providing you with a high-quality audio experience as long as they are set up correctly. They can be installed in-wall into a variety of wall types, including gypsum wallboards, plaster and lath, and paneling. They can also be installed into an assortment of ceiling types.Installation of this ceiling sound system is a relatively simple process. Each one requires a hole that is exactly 8 5/8-inches deep. Four standard dogleg clamps will hold each of the speakers in place. The grilles attach magnetically. You will also need speaker wire to make the electrical connection between the speakers and the amplifiers. The amounts you will need range from 20 feet for 18 AWG to 90 feet for 12 AWG. Your speaker wire consists of two strands of wire, one positive and one negative. Connect the positive speaker wire to the positive terminal and the negative wire to the negative terminal. If you want to get the fullest stereo sound, place the two Bose devices at equal distances from your listening area. To find a good space between the joists and avoid electrical wiring and plumbing pipes, use a stud finder.Once your Bose Virtually Invisible 791 Speaker is properly installed, its face grille will be level with the ceiling. Since these items have no bezels, you can paint them, including their grilles, any color you like. They will seamlessly blend right in with your décor. With this stereo ceiling system, you can have a lot more floor space inside your home, and you will never find yourself tripping over unwieldy cords or wires. Sales tax may apply when shipping to: IA*, MN*, NY(8.875%), WA*. We usually ship the same business day if the order is received before 3:00 p.m. EST. No orders are processed or shipped on Saturdays or Sundays. Next Day and 2ND Day shipment service generally excludes Saturdays, Sundays, and holidays. They deliver an immersive experience whether playing quietly as background music or at louder volumes for a party! I find the bass, mid-range and high range frequencies something you don't even think about because they just seem to be naturally balanced. They are mounted in a 3/4 inch thick pine plank ceiling in a room measuring 11 by 24 feet and 8 ft ceilings. Driving them with the Sonos Amp. Hooked these up to a Sonos Connect:AMP and was extremely impressed with the clarity of the sound. Heard details in the music I have only previously heard on my studio monitors. Very impressed! Nice Sound! easy to set up! Value/Sound 4/5, elegant enclosure, Nice Grill Finish, i recommend this product for large room, the bass is not strong enough! You have to buy a Sub! Bose in-ceiling speakers radiates sound evenly over a wide area, unlike the conventional ones which are uni-directional.